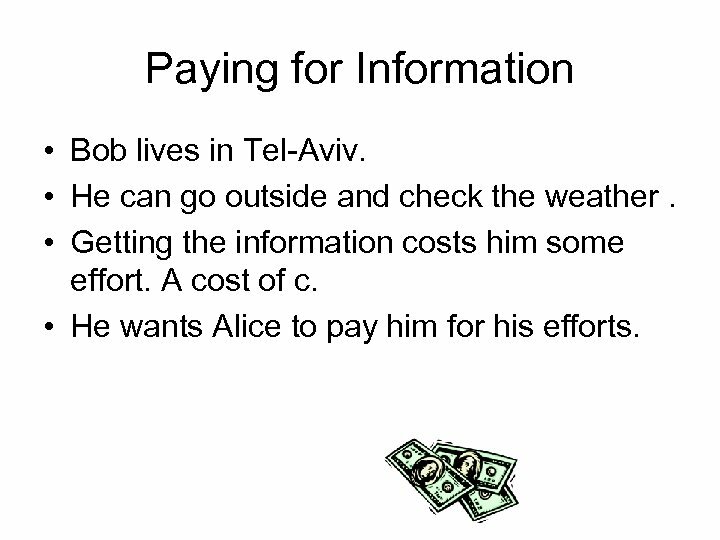 Paying for Information • Bob lives in Tel-Aviv. • He can go outside and check the weather. • Getting the information costs him some effort. A cost of c. • He wants Alice to pay him for his efforts. Paying for Information • If Alice pays him c$ no matter what he says he can just make something up. 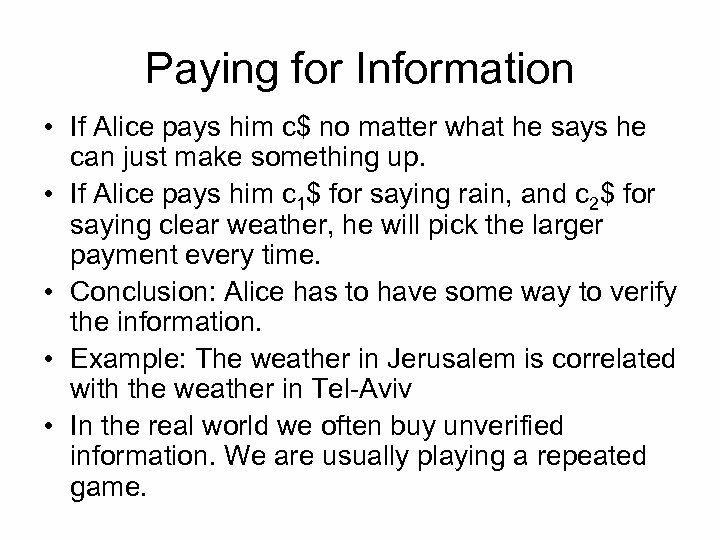 • If Alice pays him c 1$ for saying rain, and c 2$ for saying clear weather, he will pick the larger payment every time. • Conclusion: Alice has to have some way to verify the information. • Example: The weather in Jerusalem is correlated with the weather in Tel-Aviv • In the real world we often buy unverified information. We are usually playing a repeated game. 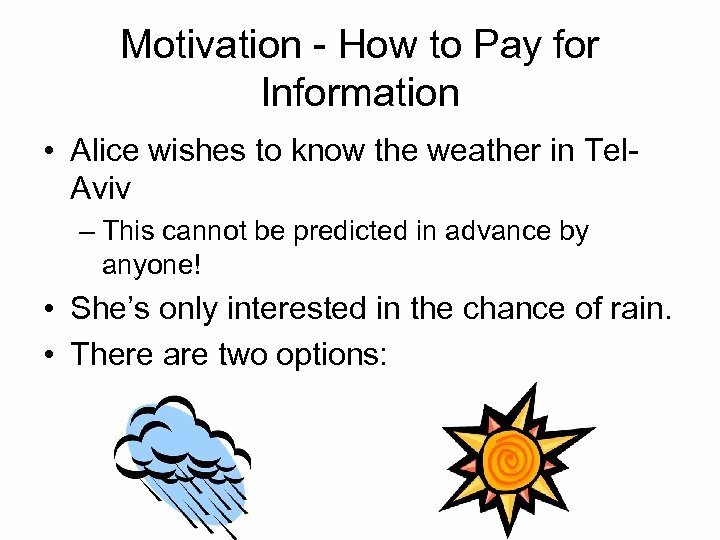 How to Pay for Information • Bob knows that Tel-Aviv is usually sunny. • His beliefs affect the cost-benefit analysis. 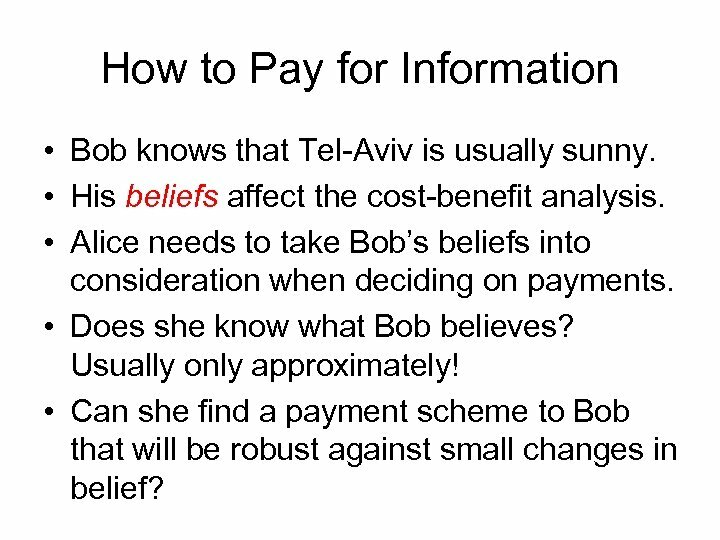 • Alice needs to take Bob’s beliefs into consideration when deciding on payments. • Does she know what Bob believes? Usually only approximately! • Can she find a payment scheme to Bob that will be robust against small changes in belief? 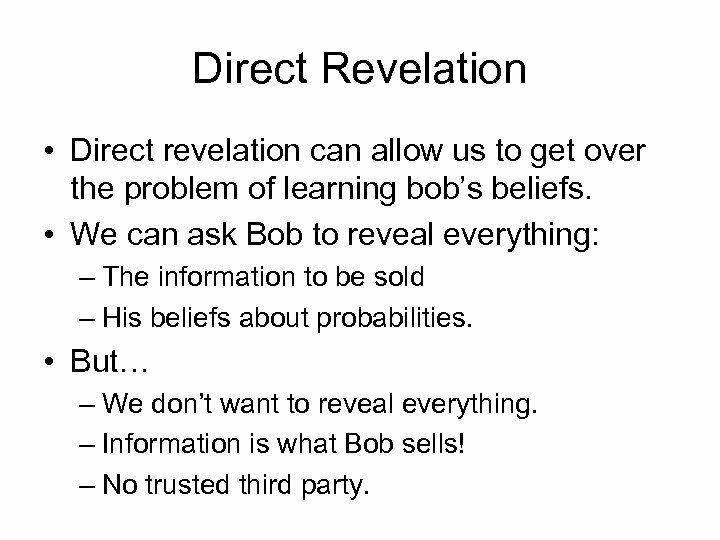 Direct Revelation • Direct revelation can allow us to get over the problem of learning bob’s beliefs. • We can ask Bob to reveal everything: – The information to be sold – His beliefs about probabilities. • But… – We don’t want to reveal everything. 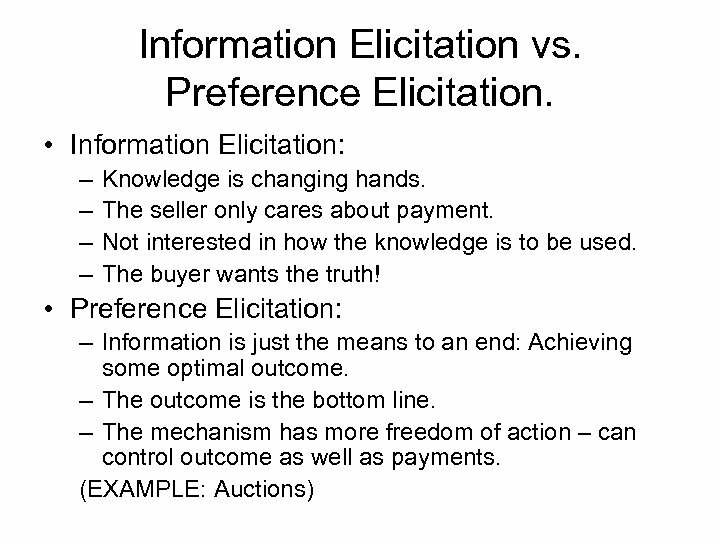 – Information is what Bob sells! – No trusted third party. 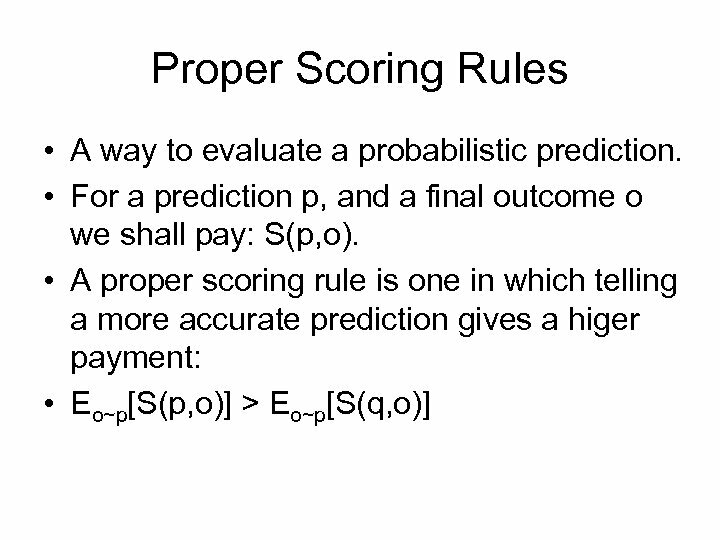 Scoring Rules • Predictions are given in the form of probability distributions. 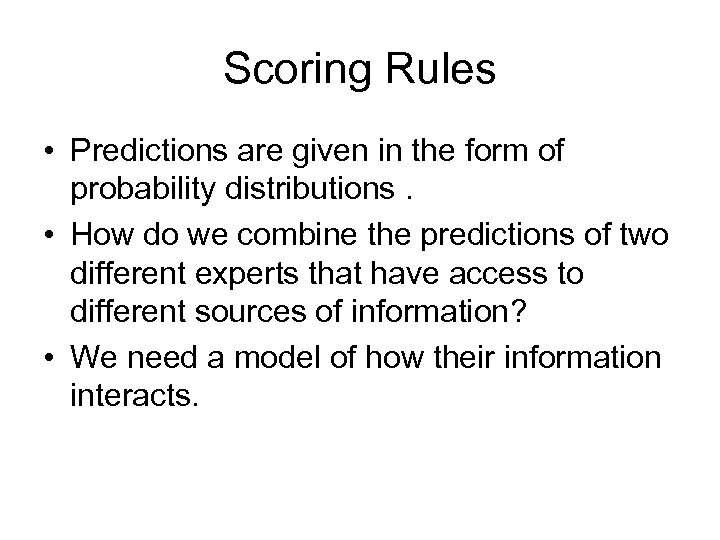 • How do we combine the predictions of two different experts that have access to different sources of information? 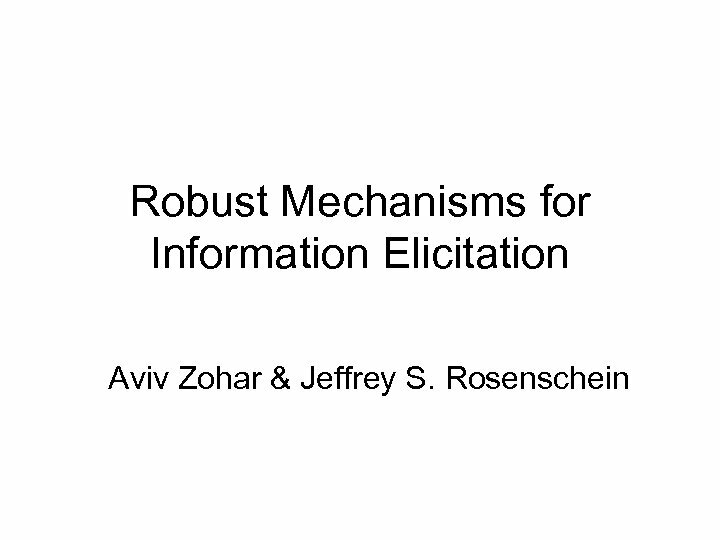 • We need a model of how their information interacts. 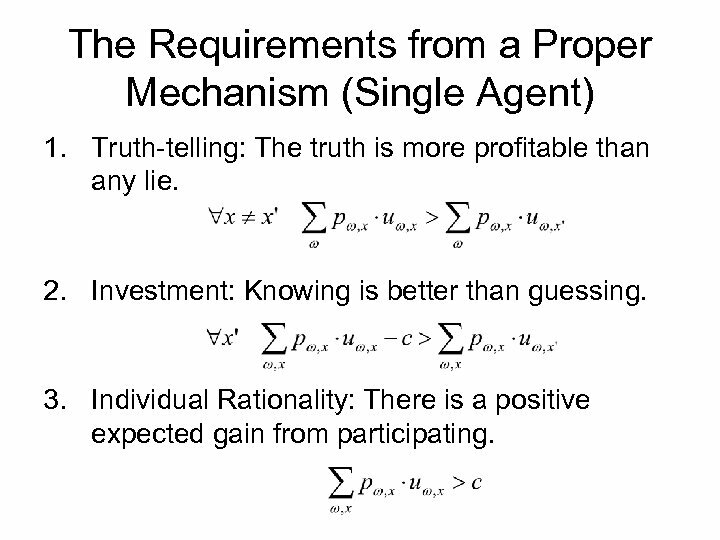 The Requirements from a Proper Mechanism (Single Agent) 1. Truth-telling: The truth is more profitable than any lie. 2. Investment: Knowing is better than guessing. 3. 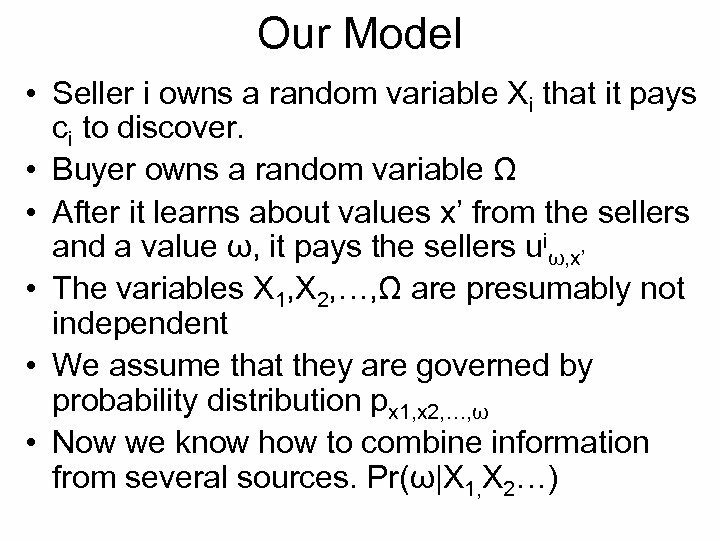 Individual Rationality: There is a positive expected gain from participating. Finding a Mechanism • We assume P is known. 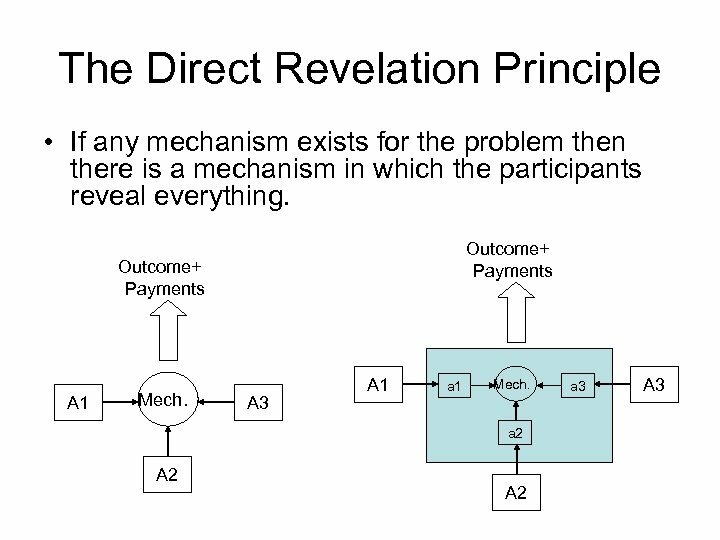 • The constraints are all linear in the payments u. • We can find a payment scheme using some LP solver. 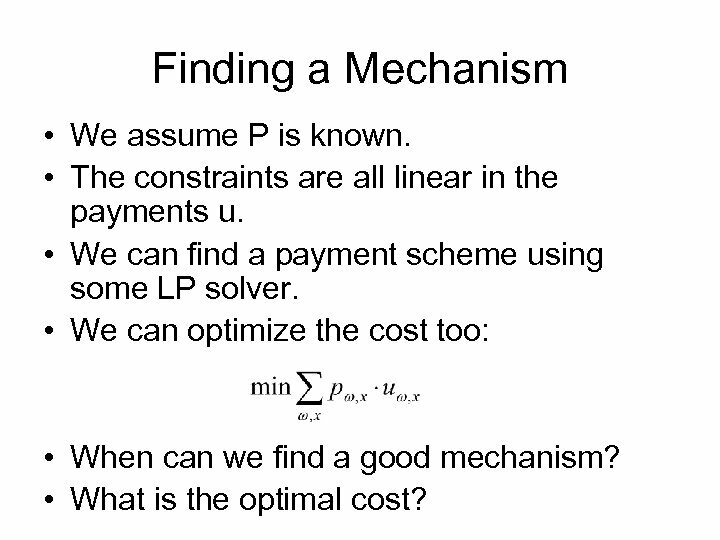 • We can optimize the cost too: • When can we find a good mechanism? • What is the optimal cost? 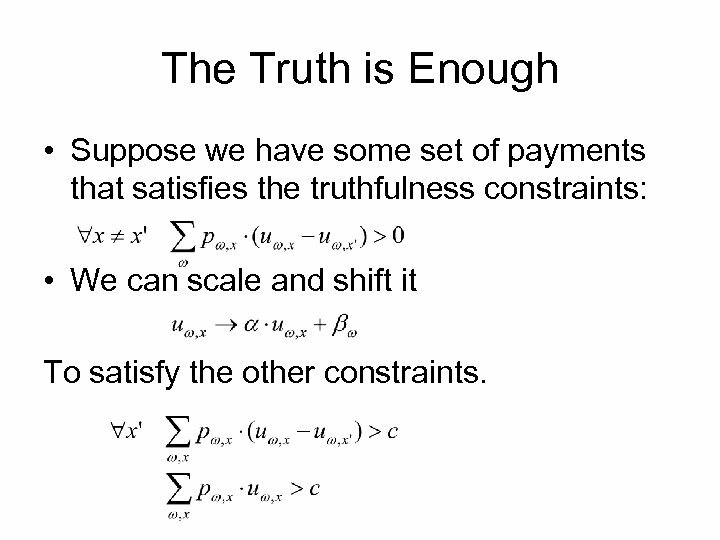 The Truth is Enough • Suppose we have some set of payments that satisfies the truthfulness constraints: • We can scale and shift it To satisfy the other constraints. Existence of a Mechanism • A mechanism exists if and only if all vectors px are pair-wise independent. 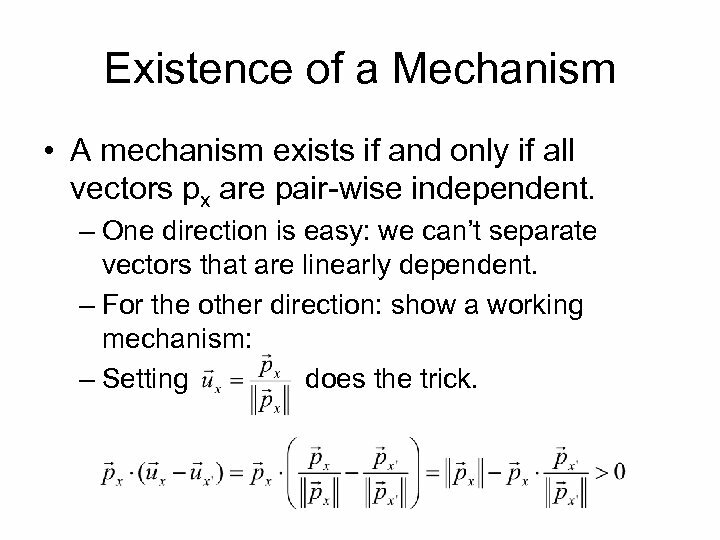 – One direction is easy: we can’t separate vectors that are linearly dependent. – For the other direction: show a working mechanism: – Setting does the trick. 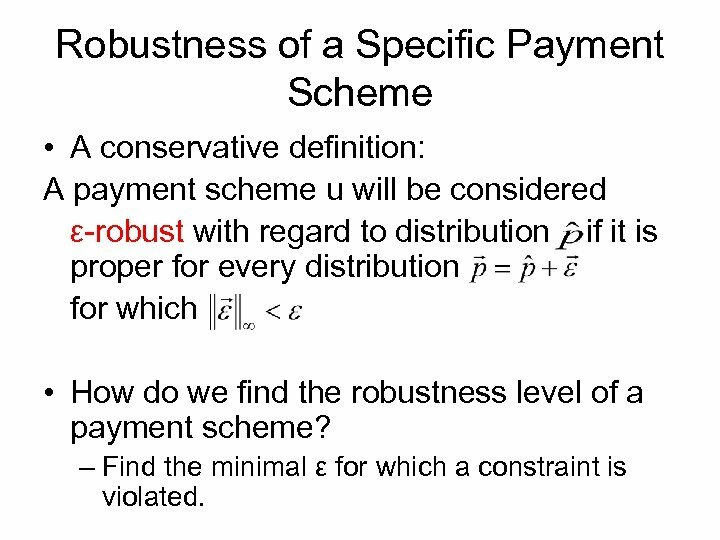 Robustness of a Specific Payment Scheme • A conservative definition: A payment scheme u will be considered ε-robust with regard to distribution if it is proper for every distribution for which • How do we find the robustness level of a payment scheme? – Find the minimal ε for which a constraint is violated. 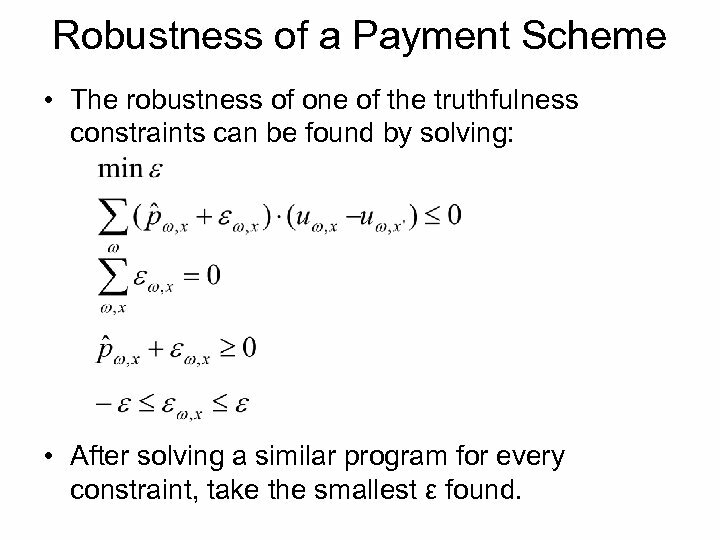 Robustness of a Payment Scheme • The robustness of one of the truthfulness constraints can be found by solving: • After solving a similar program for every constraint, take the smallest ε found. 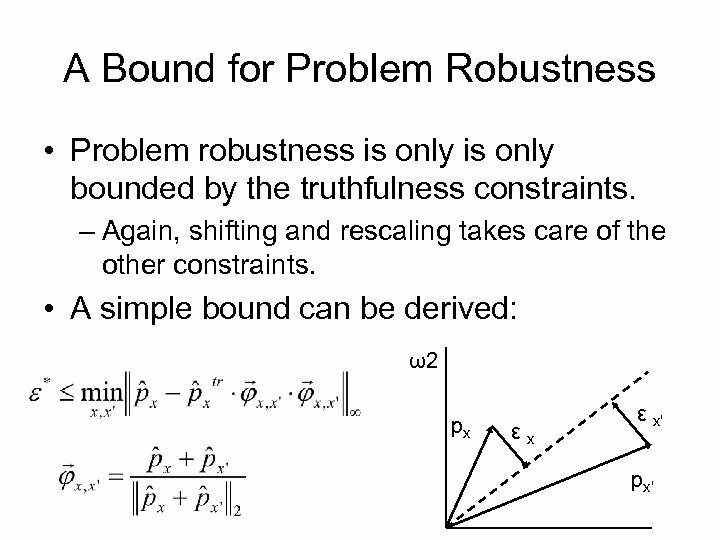 Finding a Robust solution • Given an ε, all ε-robust solutions form a convex set. 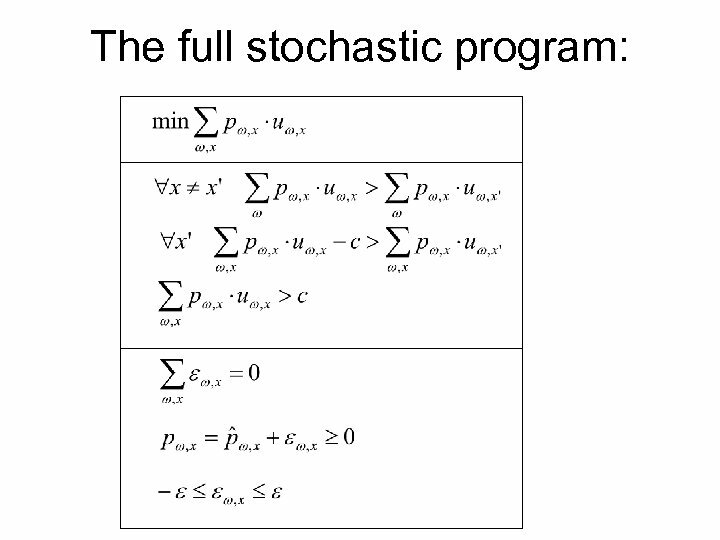 • This is a stochastic programming problem. – Find a solution to a mathematical program with uncertainty regarding the constraints. 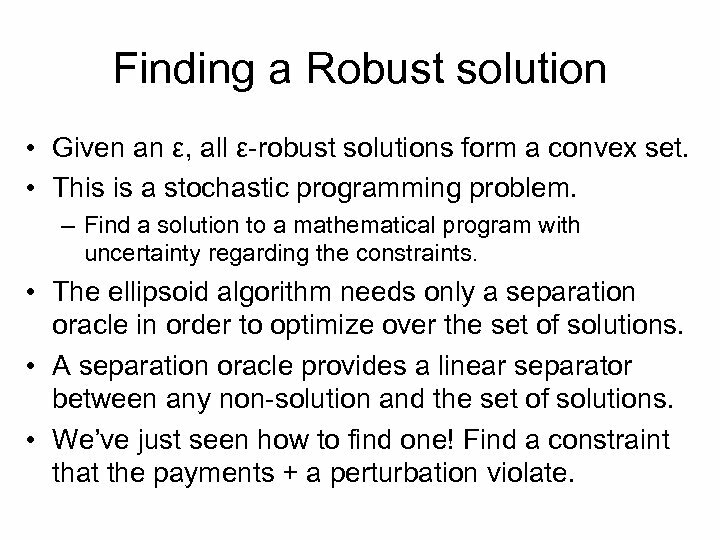 • The ellipsoid algorithm needs only a separation oracle in order to optimize over the set of solutions. • A separation oracle provides a linear separator between any non-solution and the set of solutions. • We’ve just seen how to find one! 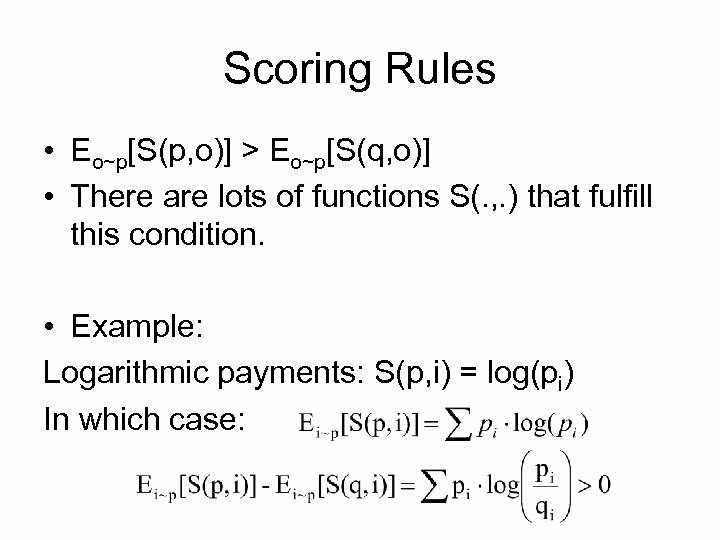 Find a constraint that the payments + a perturbation violate. 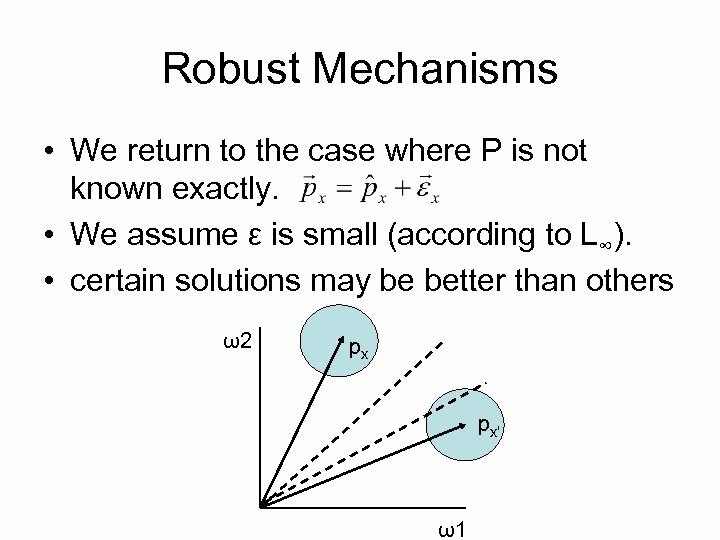 Robust Mechanisms • Definition: The robustness level of a problem p is the largest ε that can be set as the robustness of a solution. • How can we find it? • Use binary search. – The robustness level is somewhere between 0 and 1. 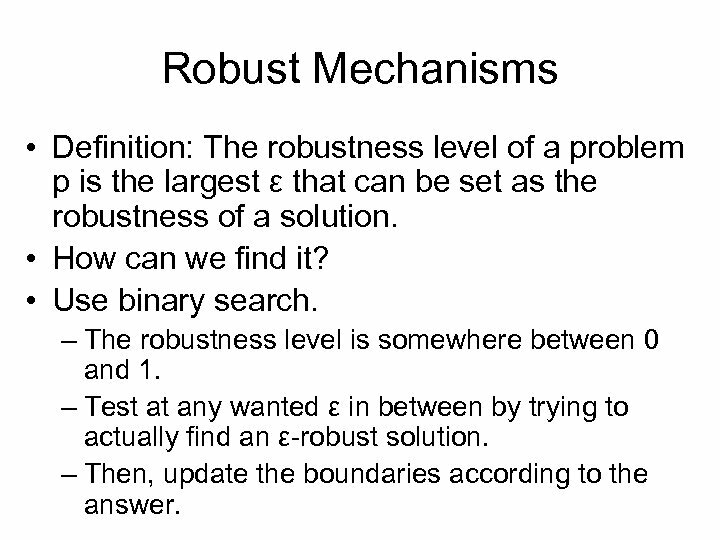 – Test at any wanted ε in between by trying to actually find an ε-robust solution. – Then, update the boundaries according to the answer. 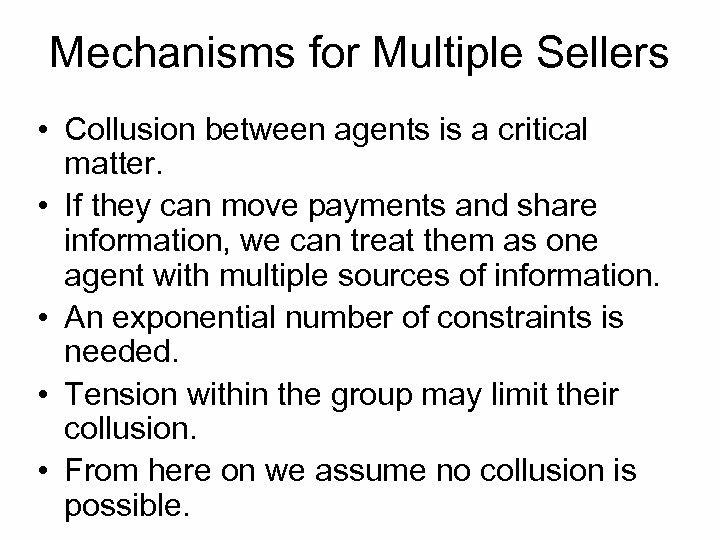 Mechanisms for Multiple Sellers • Collusion between agents is a critical matter. • If they can move payments and share information, we can treat them as one agent with multiple sources of information. 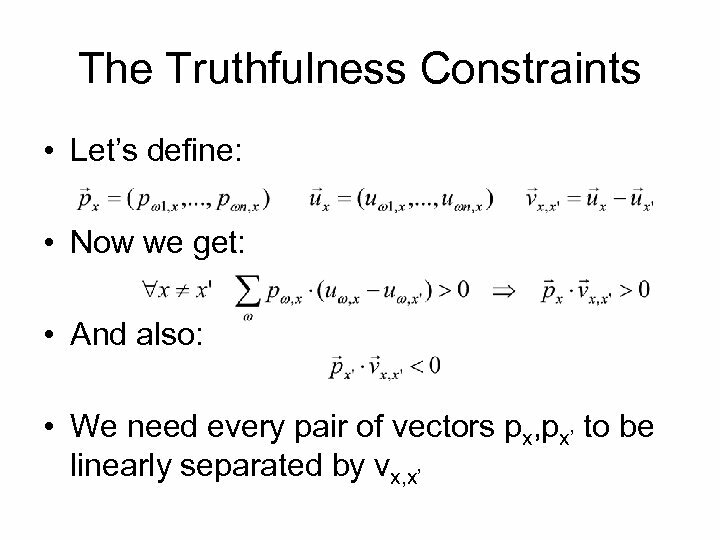 • An exponential number of constraints is needed. • Tension within the group may limit their collusion. • From here on we assume no collusion is possible. 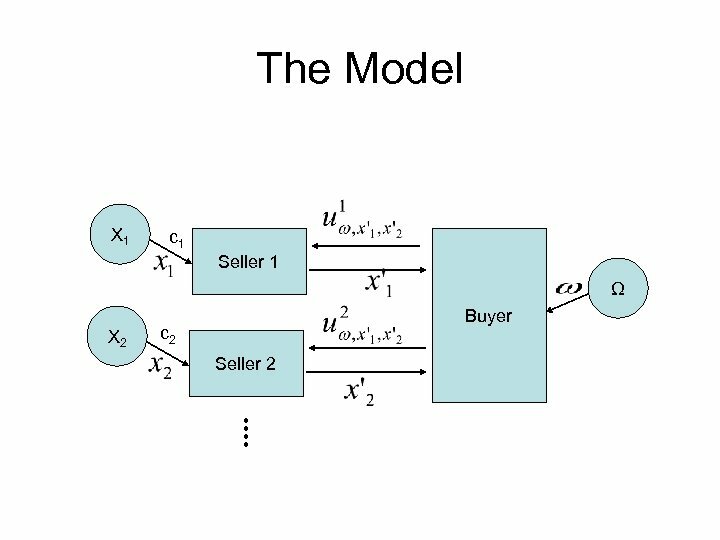 Mechanisms for Multiple Sellers Two main options: 1. 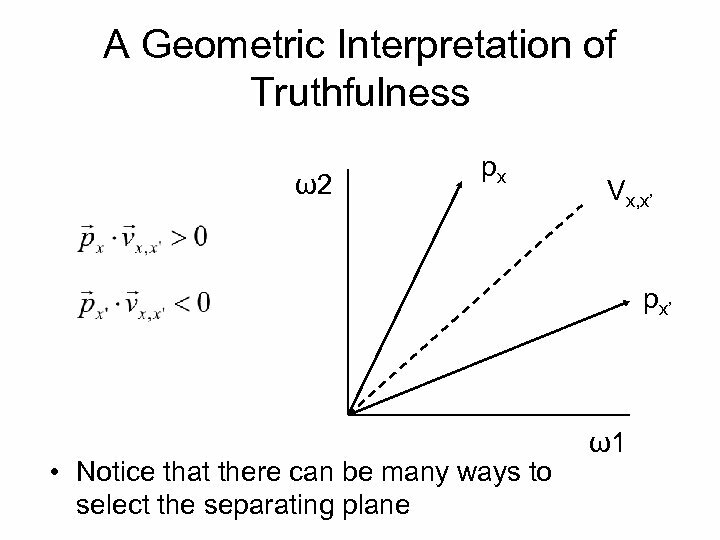 Mechanisms that work in only in equilibrium. – Truth telling is profitable only when everyone else does it. 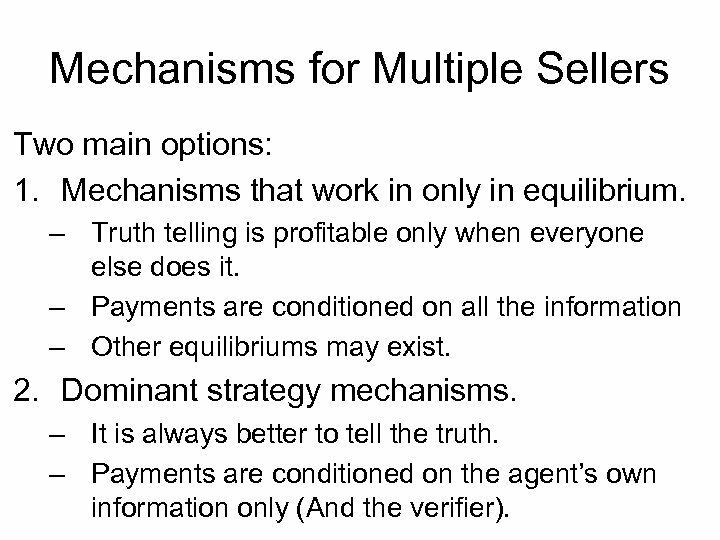 – Payments are conditioned on all the information – Other equilibriums may exist. 2. Dominant strategy mechanisms. – It is always better to tell the truth. 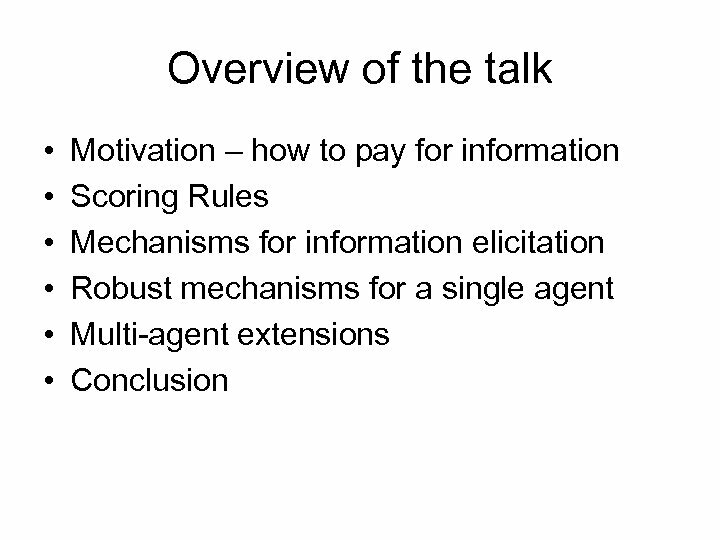 – Payments are conditioned on the agent’s own information only (And the verifier). 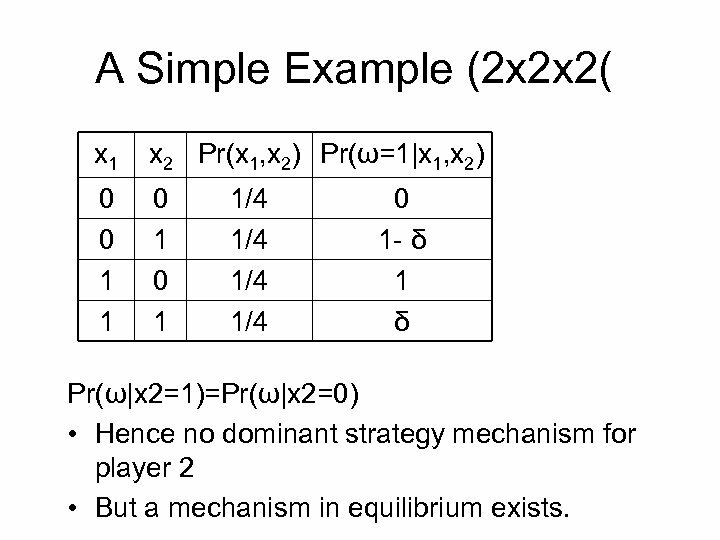 A Simple Example (2 x 2 x 2( x 1 x 2 Pr(x 1, x 2) Pr(ω=1|x 1, x 2) 0 0 1 1/4 1/4 0 1 - δ 1 δ Pr(ω|x 2=1)=Pr(ω|x 2=0) • Hence no dominant strategy mechanism for player 2 • But a mechanism in equilibrium exists. 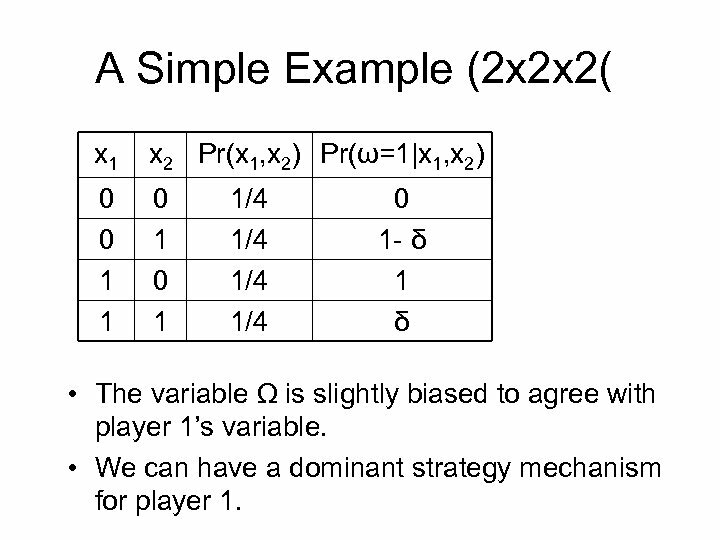 A Simple Example (2 x 2 x 2( x 1 x 2 Pr(x 1, x 2) Pr(ω=1|x 1, x 2) 0 0 1 1/4 1/4 0 1 - δ 1 δ • The variable Ω is slightly biased to agree with player 1’s variable. • We can have a dominant strategy mechanism for player 1. What can we do? 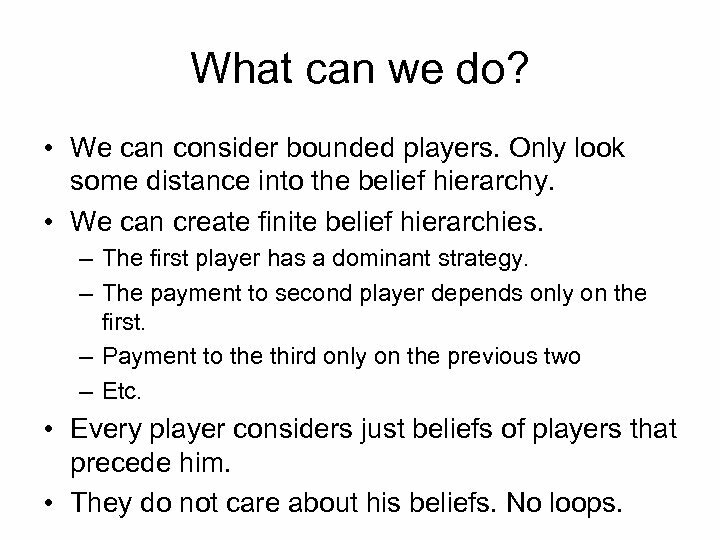 • We can consider bounded players. 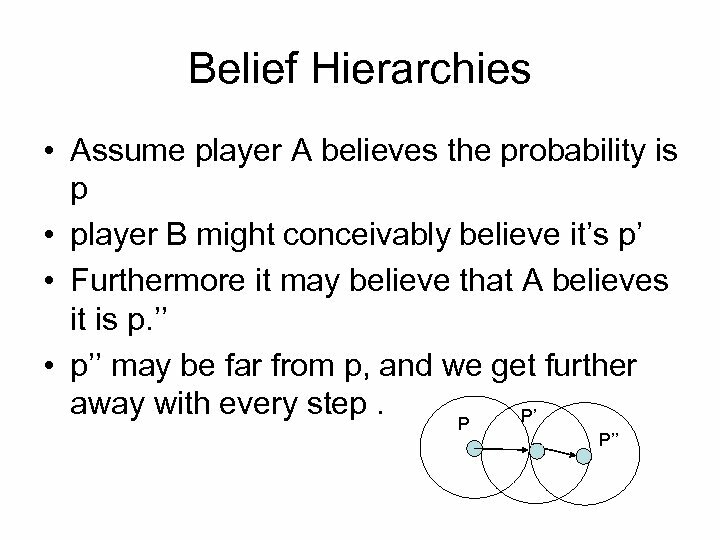 Only look some distance into the belief hierarchy. • We can create finite belief hierarchies. – The first player has a dominant strategy. – The payment to second player depends only on the first. – Payment to the third only on the previous two – Etc. • Every player considers just beliefs of players that precede him. • They do not care about his beliefs. No loops. 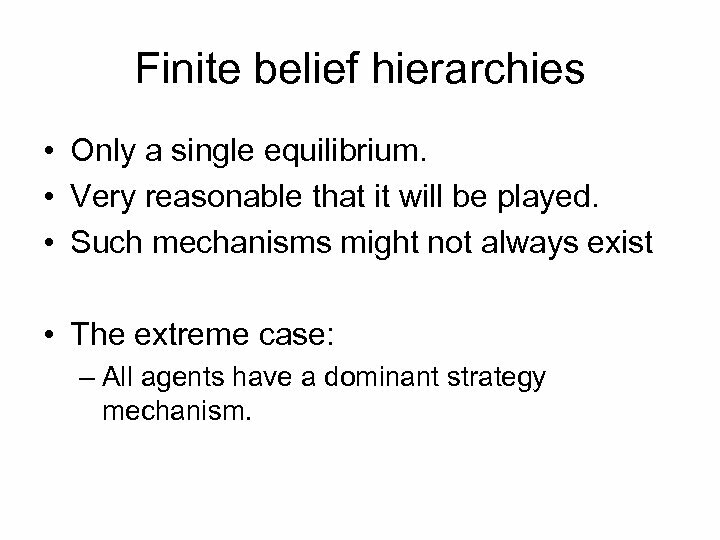 Finite belief hierarchies • Only a single equilibrium. • Very reasonable that it will be played. 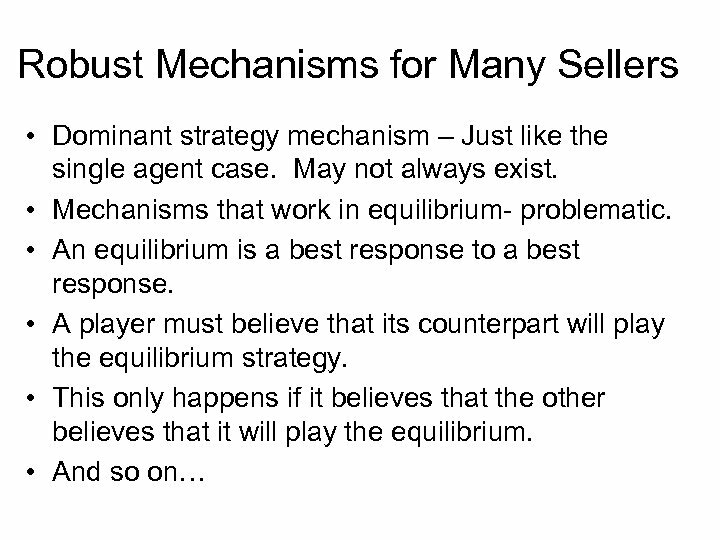 • Such mechanisms might not always exist • The extreme case: – All agents have a dominant strategy mechanism. 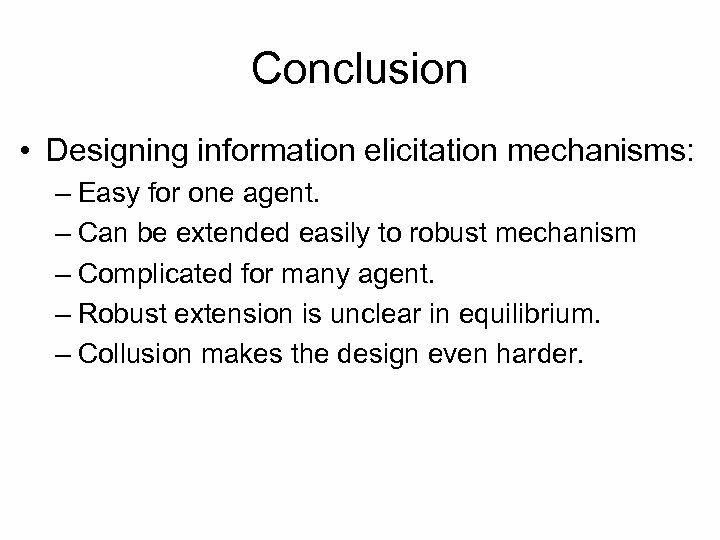 Conclusion • Designing information elicitation mechanisms: – Easy for one agent. – Can be extended easily to robust mechanism – Complicated for many agent. – Robust extension is unclear in equilibrium. – Collusion makes the design even harder.